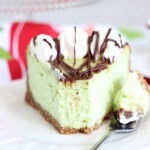 This Amaretto Pistachio Cheesecake has distinct, but delicate pistachio flavor, and a jolt of amaretto boosts its depth. Pistachio shines when accompanied by almond. 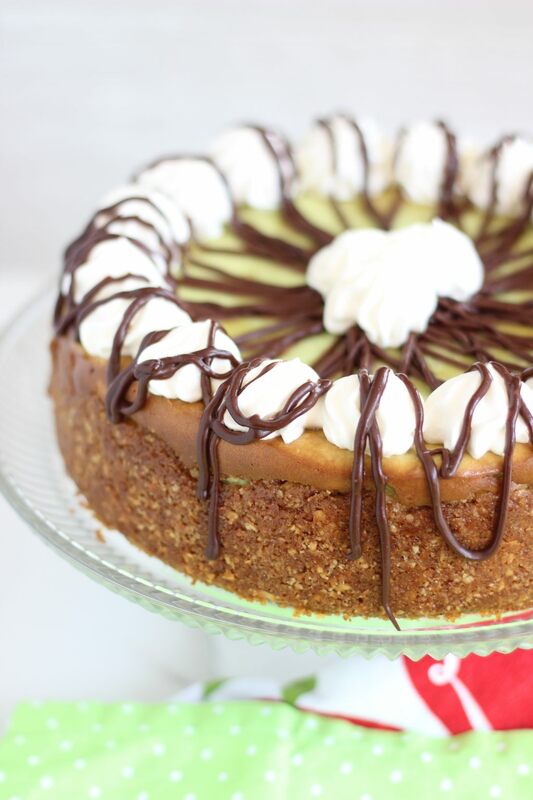 Amaretto liqueur and graham cracker-almond crust round out this Amaretto Pistachio Cheesecake! Hiiii. If you love instant pistachio pudding, stay awhile because you will like what you are about to see. This Amaretto Pistachio Cheesecake is the ultimate springtime cheesecake. 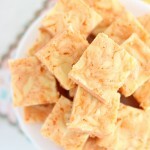 So pastel and pretty and full of a wonderful combination of flavors! If you don’t love pistachio flavoring from pistachio pudding mix, then you might want to click out. 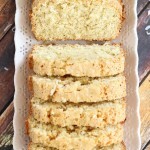 BUT, have you tried my Grandma’s Pistachio Bread yet? It will change your mind about pistachio pudding mix, I promise. Or maybe these Grinch Cookies (Pistachio Pudding Cookies) will change your mind! 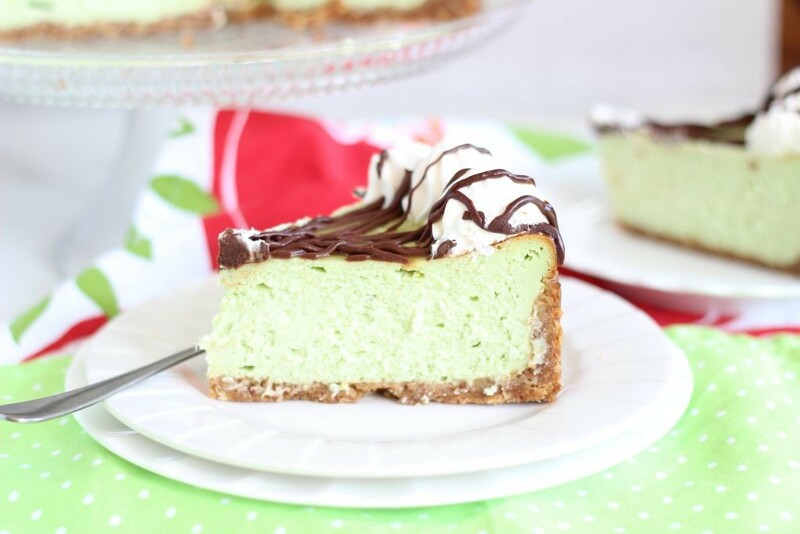 If those recipes don’t, this Amaretto Pistachio Cheesecake is guaranteed to. Pistachio pudding and real pistachios cannot be compared. Obviously. I’m sure you are also aware of this fact! They are such distinct flavors, right? Pistachio pudding is like a flavor all by itself. There’s the real, actual pistachio nuts, then there’s pistachio pudding mix. Different, but sort of the same. “Pistachio pudding” should really be its own designated flavor, separate and apart from pistachio nuts. Yes, the flavor is artificial, but it’s stronger and sweeter, and it has an almond/amaretto flavor that is so perfectly complementary. I love it, and I’m not ashamed to use it. Fluorescent green hue and all. 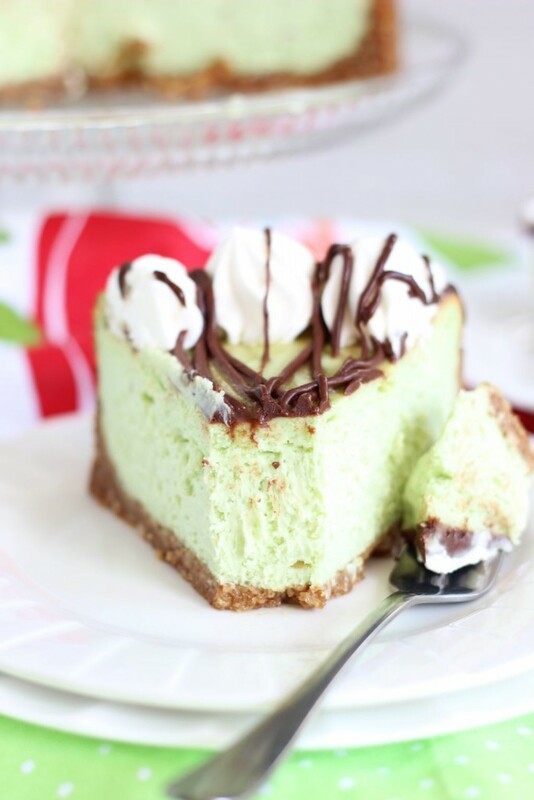 This Amaretto Pistachio Cheesecake is all the lovelier for that green shade, don’t you think? 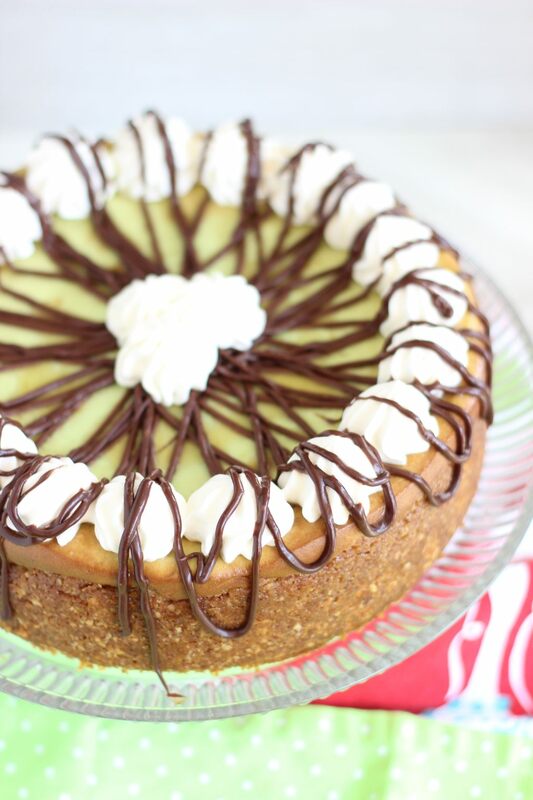 The pistachio pudding mix flavor is soft and delicate, but sweet and almond-y in this Amaretto Pistachio Cheesecake. Soft, but still potent. Hard to explain. Lots of pistachioness shines in my favorite dense, but creamy and rich cheesecake base, and a hint of amaretto liqueur and almond extract to help highlight the pistachio! The graham cracker crust in this Amaretto Pistachio Cheesecake is thick, buttery, sweet, slightly salty, and no-bake! Store-bought graham cracker crusts always seem so stale and flavorless, so make it from scratch. It only takes a few minutes, and it’s worth it. I added finely ground almonds to the graham cracker crust so that it would add a boost of flavor to the amaretto in this Amaretto Pistachio Cheesecake! 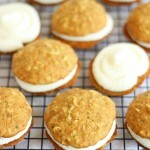 Another great option would be to use amaretti cookies for the crust! If I make this cheesecake again this spring, I’m going to try that. I think they would go far in highlighting the amaretto flavors. A teeny swirl of chocolate sauce on top adds a pretty garnish, and is a nice contrast. Not necessary, but I felt like it added to the experience. All in all, this Amaretto Pistachio Cheesecake is a pretty simple dessert to make, but the flavors and the color are so delightful for a spring dessert! One of my favorite cakes of all time includes pistachio, this Coconut Pistachio Bundt Cake. The coconut + pistachio duo is so underrated, and that cake deserves more blog love! I also made these Pistachio Sugar Cookie Bars with Cream Cheese Frosting into a coconut/pistachio version: Coconut Pistachio Bars. I recently posted these Thumbprint Pistachio Cookies. 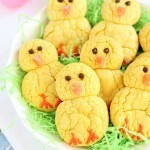 They’re delicious and adorable – they’d be fantastic for Easter, Mother’s Day, or bridal/baby showers. I mentioned my Gma’s Pistachio Bread recipe, one of our family favorites, and I created a few other versions of it: Maraschino Cherry Pistachio Bread, Triple Chocolate Pistachio Bread, and this Cheesecake-Stuffed Pistachio Bread. This Amaretto Pistachio Cheesecake has distinct, but delicate pistachio flavor, and a jolt of amaretto boosts its depth. 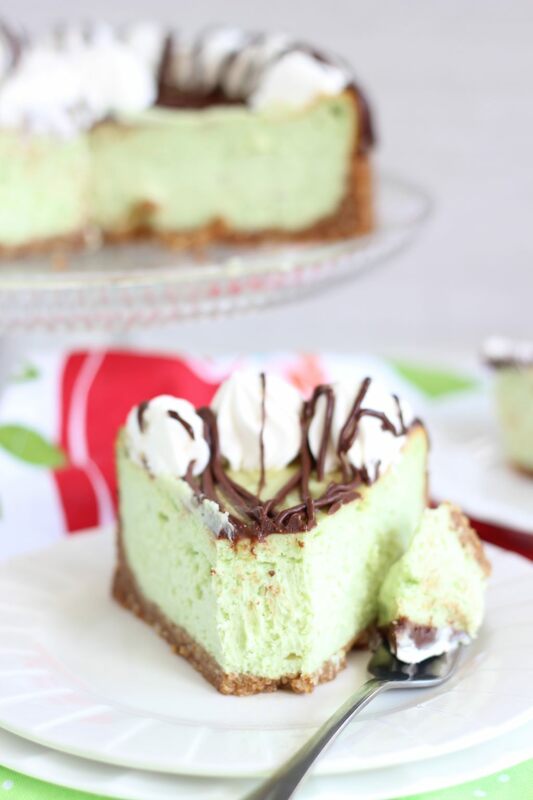 This Amaretto Pistachio Cheesecake is so smooth, creamy, and rich! 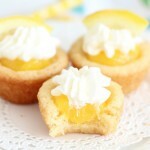 Such a lovely dessert for springtime! In a large bowl, combine graham cracker crumbs, ground almonds, sugar, and butter. Press into the bottom and about an inch up the sides of a greased 9-inch springform pan. Add sweetened condensed milk, pudding mixes, amaretto, and almond extract, beating until smooth. Bake at 350 degrees for about 75 minutes, or until golden at the edges, puffy at the edges, and til the center is almost set. Cool on a wire rack for 20 minutes before releasing the sides of the pan. Cool completely. Top with whipped cream and chocolate sauce for garnish, and cut to serve! I’m a pistachio freak and this looks aaaamazing! So pretty and I’m sure delicious. Pinning for later. This is heavenly and I have pinned it. Eating it while on the treadmill might be a good idea! You are probably right about that! Lol! I love pistachio pudding so this is a must for me. It even looks awesome. Love the chocolate on it. Pinning. I love it too. There’s just something about pistachio pudding…. This looks so yummy! Thanks for sharing at Create Link Inspire. 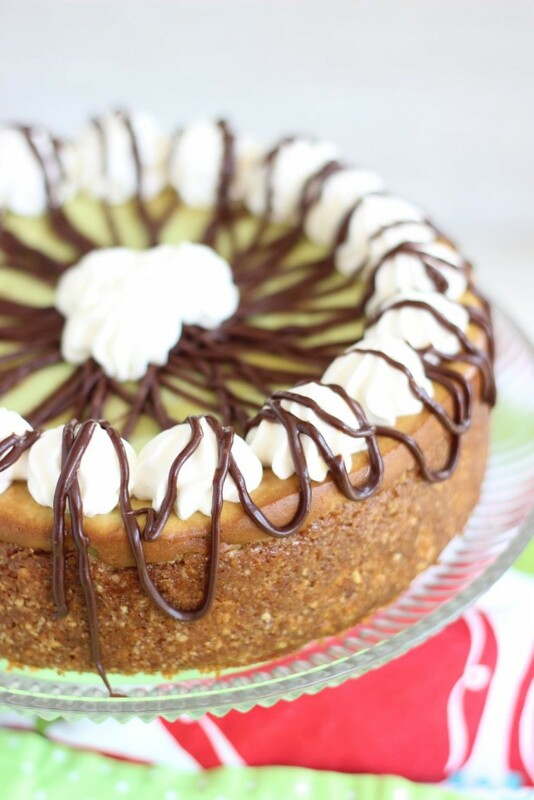 It’s been years since I’ve tasted pistachio pudding…but I love the idea of using it in a cheesecake like this! The color is gorgeous and that chocolate drizzle looks perfect!! Sound so amazing & looks pretty! YUM. Thanks for sharing at the #InspirationSpotlight party. Pinned & shared. Super beautiful and super delicious looking cheesecake!! Just wondering if you could substitute something else in place of the amaretto liqueur. I don’t have any and it would be quite a bit to buy for only the small amount used. What size of pan did you put it in? It’s not in the instructions? I use a 9-inch spring form. Though an 8-inch would work too! I just have a question – it looks like the crust comes up around the back a bit. Do I just try and press it up around the sides as well? Please let me know how high I should be trying to get it. 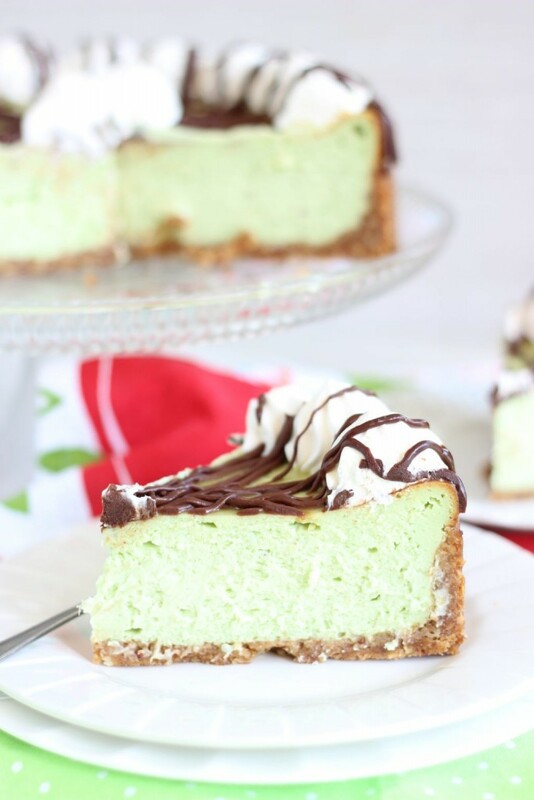 All my boyfriend wants for his birthday is pistachio cheesecake and this one looks perfect 🙂 also, I was thinking of doing a white chocolate for the top instead of dark or milk! I agree about the size of the pan…next time I will use a 9 inch, though it wasn’t that I had too much batter, per say, as the recipe clearly states 3 8oz blocks of cream cheese. Mine took much longer to bake…at 75 minutes it was still very loose.,..gave it another 15 min…still baking…we shall see. It’s for Easter dessert so I hope it turns out! How did it turn out?? I hope it was successful for you! Thanks so much for letting me know about the baking time, I will make a note in the post. I hope you had a wonderful Easter! 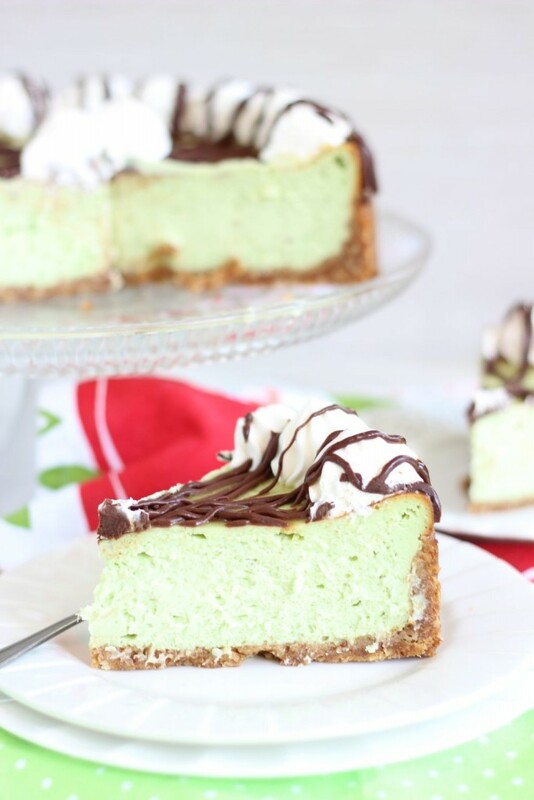 I just made this cheesecake for St. Patrick’s Day. First off, there is way too much batter for an 8-inch springform pan. I had to change over to a 9-inch and still had batter left over. Also, the crust is too thick for an 8-inch springform pan and even the 9-inch springform pan. After my adjustments, it came out pretty well but your measurements are way off. I never give reviews, but this needed tweaked in several areas. As soon as I read 5 8-oz cream cheese’s, I knew it was going to overflow the 8-inch pan. The crust almost can be halved. It was hard to cut through when taking bites. Hi! Thank you so much for your comment and feedback. You’re definitely right about the size of the springform – I use a 9-inch, and an 8-inch is mistaken. I’m so sorry for that. I’ll make that change ASAP. As for the cheesecake batter, I will retest over the summer. I typically use 3 or 4 bricks of cream cheese, but following a recipe from Taste of Home that called for 5. I will retest when I take a summer break to revisit older recipes to see if they need to be updated. I appreciate you pointing this out. Do you have problems with the top cracking? Is it possible to use this recipe with a water bath? Occasionally, yes! And to be honest, a cracked top doesn’t bother me because I usually cover the top of the cheesecake anyway. I’m nitpicky about baking, but that’s just one thing that never really bothered me. My friend Jen @ Baked By An Introvert uses the water bath method on her cheesecakes though, so if you want to get a feel for how someone else does it, I would check out her blog – her Nutella Cheesecake, for example! Hahahahaha!!! I’ve had a few dessert catastrophes with my S.O. too. I put things in the fridge, nice and neat, and I tell him where everything is, and I emphasize: “Don’t touch them, don’t even LOOk at them!”, because he’s always shuffling things around in the fridge and bumping into the newest desserts!